1. Gotta have a cute mug to enjoy all those delicious warm fall drinks! 2. Pillows are a great way to reflect seasonal decor since you can switch them out so easily, and buffalo plaid sets the perfect fall vibe. 3. Since nothing warms you up on a chilly morning like coffee, why not try a new coffee brew method like a pour over instead of your standard drip brew? It may be your new favorite process for many falls to come! 4. Pumpkin spice syrup means that you can basically turn anything into a fall flavored treat! 6. … and speaking of cozy blankets, make sure you have one like this nearby! 7. Add some fall spices (and a warm glow) to the night air with a deliciously scented candle. 8. As it gets colder and you start to spend more time indoors, set the mood with a record player and some new records (try “Autumn in New York” for a start). 9. Who said picnics need to end when summer does? Spread out a blanket in the park, stock this cute basket with some wine and cheese and enjoy the colored leaves falling all around you. 10. A cute pair of stand out boots are essential to every fall outfit collection (leopard is perfect for fall too!). 11. Try out a mulled wine kit to add some warmth and flavor to your booze collection (this one is bourbon + vanilla!). 12. If coffee doesn’t do it for you and you gots to have your tea, treat yourself to this gorgeous teapot and infuser. That rose copper color is to die for! 13. Add some essential oils (may we suggest cinnamon leaf for fall?) to a diffusor to keep your space feeling fresh and zen all day long. 14. Aaaannnnd of course, the fall pièce de résistance, the cozy sweater! We’ll take ours with pom poms please! And there you have it! The essential kit to keep your fall cozy and warm! Now, go pour yourself that hot cup of coffee and enjoy the change of seasons in style! I love your picks. Especially the sweater and the picnic basket – now I’m in a picnicking mood! Lovely picks! I could really use that candle and some gingham to welcome the fall! Any other favorite blankets to share? I’m looking for one with a little more color! These are all so gorgeous!!! Also, can I just say thank you for picking stuff that us average joes can afford to buy, instead of stuff only Gwyneth Paltrow and Oprah can afford?! LOVE it!!! You’re awesome!! 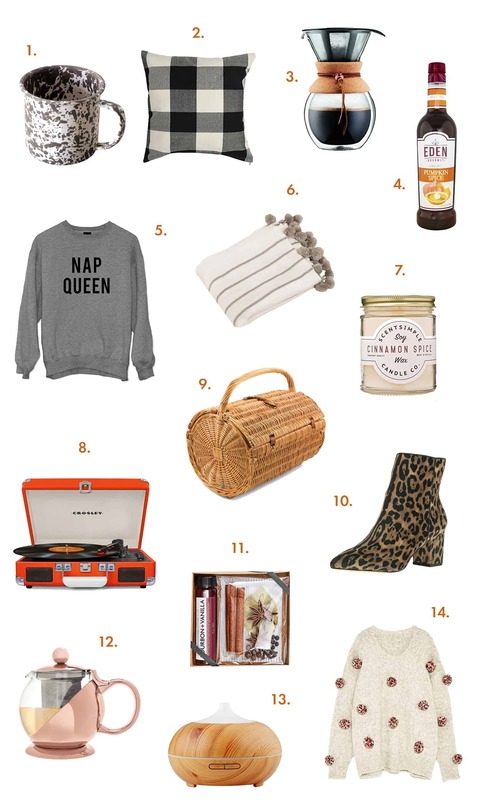 This roundup had me at the buffalo check pillow but then add in the “nap queen” sweater and it’s just perfection! Thanks for sharing these great finds! I’m definitely a fan of the sweaters and the teapot! The record player is a “must have”. Love that color! Perfect fall list, absolute essentials! Love all of the above! Autumn is by far my favourite season and all these things just make me even more excited!